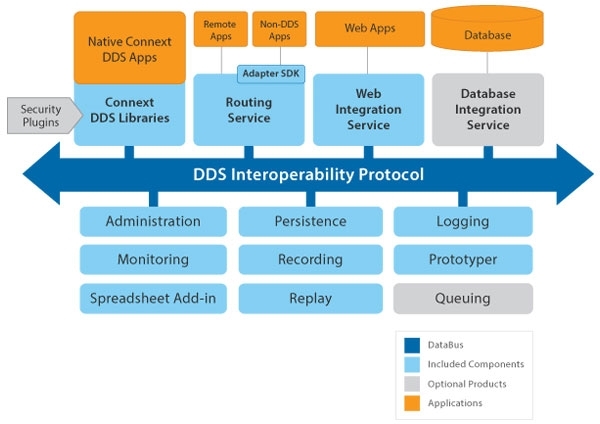 RTI Connext DDS provides a messaging and integration infrastructure for demanding, mission-critical Industrial Internet of Things distributed applications. It combines deterministic performance, low latency, high throughput, and fault tolerance into a fast and scalable open architecture for real-time systems. By enabling loosely coupled integration, the solution significantly reduces long-term software maintenance costs. Individual subsystems may be modified, added, or upgraded without impacting existing software. RTI Connext DDS complies with the Object Management Group (OMG) Data Distribution Service (DDS) for Real-Time Systems specification, the leading standard for real-time application integration. System designers and application developers can incorporate Connext DDS into their Simulink® designs as virtual components, ready to connect to other Simulink and non-Simulink components through a DDS databus. Users can generate code from Simulink models and deploy their models integrated with a DDS databus. They can also acquire and publish data into MATLAB® from a DDS databus. Explore selected hardware support for RTI.